Togo, a country, is located in Africa. It shares its borders with Ghana, Benin, Burkina Faso and Gulf of Guinea. The capital and the largest city in Togo is Lome. From the 11th to the 16th century, several tribes from around Africa arrived in the region of modern-day Togo. These were the Ewe from the east, and the Guin and Mina from the west. These tribes settled mostly on the coastal regions. The slave trade began in the 16th century, where the region's coastal villages served as centers of the trade. For the next 200 years, the region became the major trading post for Europeans in search of slaves. Its status led to the region being nicknamed, The Slave Coast. In 1884, a treaty was signed giving Germany a stretch of territory along the coast of the region. Their control soon reached inland, and by 1905, the region came to be known as the German colony of Togoland. In the 1st World War, British troops from the Gold Coast and French troops from Dahomey invaded the German colony, and by the end of the War, the region was divided into 2 mandates, where one was administered by the British, and the other by the French. After World War II, the mandates became the UN Trust Territories, where the British Togoland voted to join the newly independent state of Ghana in 1957, and the French Togoland became an autonomous republic under the French Union in 1959. In 1960, French Togoland acquired full independence from France. By 1961, the country elected its first president, who was Sylvanus Olympio. He was, however, killed in a coup d'etat in 1963. In 1969, Etienne Eyadema was elected as President, where he remained in power until the time of his death in 2005. Serving continuously for 38 years, he became the longest serving leader in the modern history of Africa. His son, Faure Gnassingbe, was elected as President in 2005. 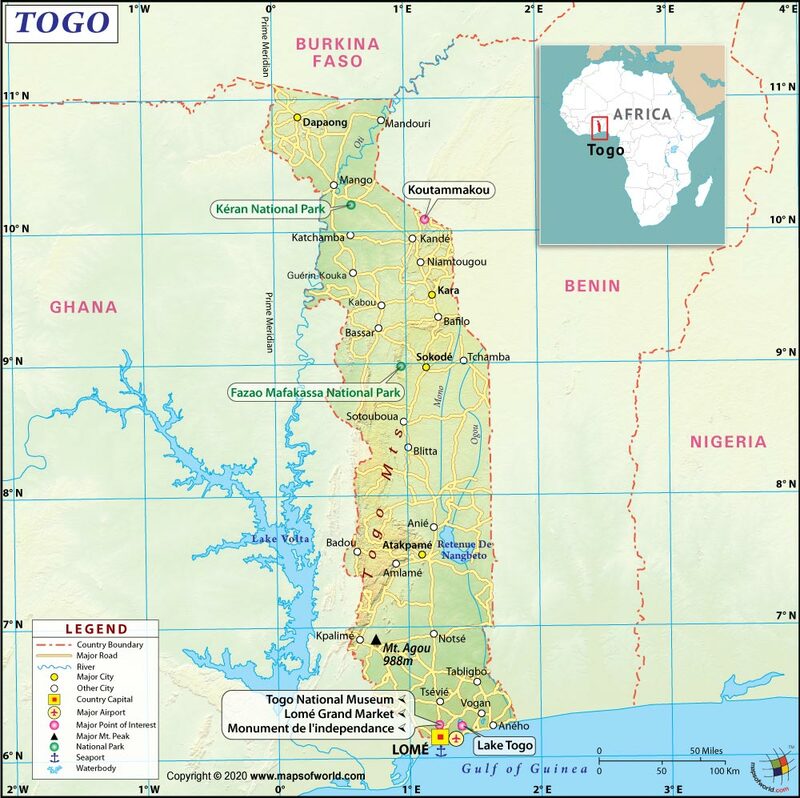 Togo is a narrow shaped country in Western Africa. Its borders are Burkina Faso to the north, Ghana to the west, and Benin to the east and north. Its southern tip is on the Gulf of Guinea, which is also the north of the Atlantic Ocean. The country's terrain is varied, with the north consisting of gently rolling savanna and the center characterized by hills. The south consists of savanna and woodland plateaus. The country has a strong dependency on agriculture, with its climate providing good growing seasons throughout the year. About 45% of the country's total land area is arable land. Togo is a presidential republic with the President as head of state and head of government. He is elected into office by popular vote. Since independence, the government has been dominated by one single party, which is the Rally for the Togolese people. Opposition parties are allowed but their chances of winning are considered to be very low. Executive power is exercised by the government, while Legislative power is practiced by the government and the parliament. Parliament consists of the 81-member National Assembly, who are elected to serve a 5-year term. Togo is not one of the more popular travel destinations in Africa. However, this small country still offers a wide range of tourism activities that travelers will enjoy. A UNESCO World Heritage Site, the Koutammakou located at the Tamberna Valley is the very symbol of Togo. 50,000 hectares of landscape serve as home to the Batamamariba people, who live in cylindrical mud-tower houses. It is the perfect place to witness the unique cultural heritage of the country. Lome, the country's capital is a far cry from the traditional houses of the Tamerna Valley. A thriving urban city, it boasts of upscale restaurants and hotels, as well as a lively nightlife scene. It is also close to excellent beaches, as well as other natural wonders that are a stone's throw away from the city. One of the most visited attractions are the National Museum of Togo, the International Museum of the Gulf of Guinea, and the Lome Grand Market. An entire block is packed with street vendors at this market, with items ranging from fresh produce to traditional medicinal remedies, to counterfeit designer bags, clothes, cosmetics, and just about anything under the sun. Primary education in Togo is free and compulsory. About 81% of the country's primary-level age children attend school. However, secondary education is sparse and very inaccessible in the rural areas, prompting many children to stop their education once they finish primary school. Other challenges faced by rural communities in the country are teacher shortages, high repetition, and high drop out rates. The country's literacy rate is at 61%. Private schools and tertiary education appear to be a luxury of the rich in Togo, where institutions are mostly found in the capital city of Lome. Togo means "house of sea" in the Ewe dialect. 32% of the country's people live below the poverty line. Togo is the world's 4th largest producer of phosphate. The population's average life expectancy is only at 54 years old, and only about 2-7% reach the age of 65. The Flag of Togo was officially adopted on April 27, 1960. The Flag of Togo comprises of five equal width horizontal stripes symbolizing the five different regions of Togo. Major ReligionOther than Christianity denominations the next largest religion is of the Baha'i Faith. Islam, and Hinduismism have small numbers of adherents. The Church of Jesus Christ of Latter-day Saints claims it has 60,680 members which is about 57% of the population of Tonga.